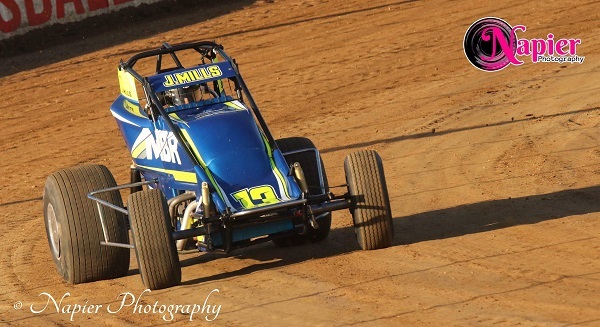 It was a big weekend of racing for Wingless Sprints in Victoria, with two events taking place in both the west and east regions of the state, and it was Jamie Mills and Travis Millar who came out on top, winning the 50 Lapper at Bairnsdale Speedway and the Stonypoint 5000 at Darlington’s Mid-Western Speedway respectively. With early rain across the state threatening to hinder the pair of meetings, drivers were relieved to see some sunshine in the latter stages of the afternoon, making them eager to get racing underway. 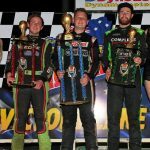 In the 50-lap feature race at the Bairnsdale venue, proceedings were anything but straight forward, with a total of eight drivers finding themselves on the infield at various stages of the race due to a range of issues. While Daryl Logue looked to be the likely winner after experiencing an almost faultless night, qualifying in pole position and leading the majority of the 50-lap distance, it wasn’t until lap 45 that disaster struck for the racer, with a right-rear tyre blowout dashing his hopes and bringing his night to a premature end. Tyre management was something that proved to be a problem for numerous drivers in the closing stages of the race, but not for Mills, who had powered forward from his eighth-place starting position to make his way into podium contention by the halfway point. In what was a dramatic finish, David Alford, who had taken over the lead from Logue, was unfortunately resigned to the same fate as his predecessor. Being picked off by Mills, who took over his place at the front of the field on lap 49, Alford then blew a tyre on the final lap, slipping back through the pack, while the rookie Wingless Sprint driver went on to claim his maiden victory in the class, recording his fastest lap of the race on the final lap in the process. Another incredibly hard-charging performance came from Brett Pope, who came from position 15 to clinch the runner-up spot, also doing so on the final lap of the race, while Viv Rockliff rounded out the podium in third place. Remaining feature-race finishers were Wayne Logue, Michael Lovell, David Alford, who did well to hold on to greet the chequered flag, Ben Grey and Clinton Ogilvie. Joining Daryl Logue on the infield were Steven Loader, another victim of a blown tyre, Daniel Mayson, rookie Matt Mills (Jamie’s brother), Travis Evans, Ross Jarred and Robert Stevenson. It was an unfortunate result for the older of the Mills brothers, who had qualified on the outside of the front row and was running in second for the opening 20 laps before Jarred’s car launched over the top of him, damaging his car in the process. Jarred was then thrown into a heavy roll but thankfully emerged from his car unharmed. Daryl Logue was the only driver to double up in his heat races with a pair of wins, with other wins going the way of Matt Mills, Jarred, Jamie Mills and Wayne Logue. Continuing what has been a strong season for him so far, Millar’s victory in the Stonypoint 5000 at Mid-Western Speedway was a convincing one, with the driver earning the pole position start for the 20-lap feature race, before leading the race from start to finish and crossing the finish line over two seconds clear of his nearest rival. It was also a great race for Phil Micallef, who held on to his second-place start from flag to flag, while Matt Bartlett was pleased to steal third place from Greg Bishop on lap 12 to clinch a podium result. Unable to chase down Bartlett to move back into podium contention, Bishop was forced to settle for fourth place, while Bhoe Paterson rounded out the top five. Final feature-race finishers were Marc Evans, Robert Whiteside, Tyson Bartlett, Rikki Stewart, Sean Fitzpatrick Mathew O’Shannassy and Evan O’Bryan. Clint McLaren was the race’s first casualty, completing just two laps before pulling to the infield, followed by Michael Skene, Elira Degrandi and Leigh Armistead. In the earlier heat races, it was Millar and Micallef who asserted their dominance, picking up two wins apiece, while other wins were shared between Whiteside and O’Shannassy. 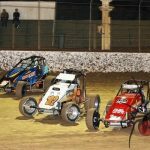 The next outing for the Victorian Wingless Sprints will be this Saturday night at Hamilton’s Western Speedway for the fifth Super Series round.